Today’s post will analyze how the brand of Manchester City FC (MCFC) performs in regard to the top 10 clubs of the Deloitte Football Money League. 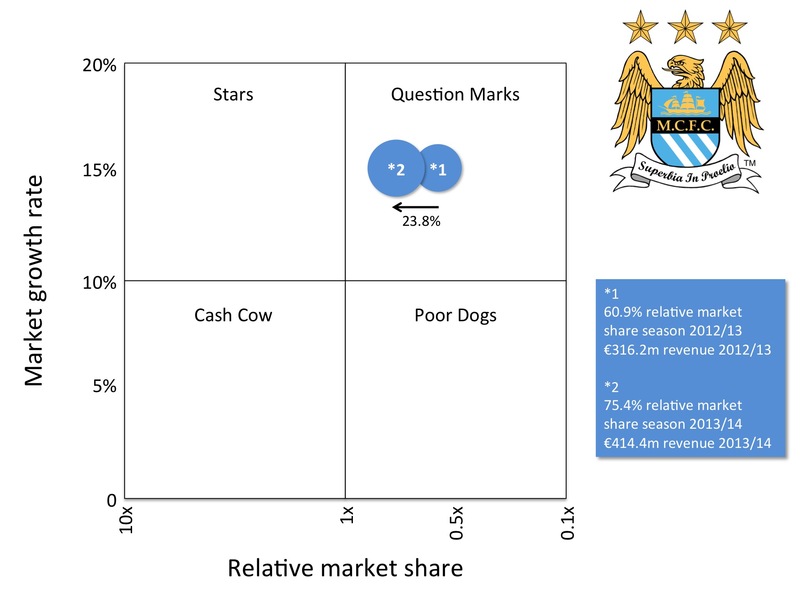 We will use the Boston Consulting Group’s (BCG) growth-share matrix that depicts, where Manchester City FC stands within the top 10 clubs in regard to market growth (limited to the top 10 clubs in the Money League) and MCFC’s relative market share. We define the total market size as the total revenue for the 2013/14 season of the top 10 clubs mentioned in the Deloitte Football Money League 2014, 2015 respectively. The Deloitte paper states that ‘the authors have used the figure for total revenue extracted from the annual financial statements of the company or group in respect of each club, or other direct sources, for the [respective] season (unless otherwise stated); revenue excludes player transfer fees, VAT and other sales related taxes; in a few cases they have made adjustments to total revenue figures to enable, in their view, a more meaningful comparison of the football business on a club by club basis (Deloitte Football Money League 2015:8)’. For the purpose of this article, the market size season 2013/14 is €4,260.7, the market size season 2012/13 is €3,695.1. This shows that MCFC is moving to the left of the chart towards the stars quadrant. Mr Kotler (2002:95) describes stars as, “the market leaders in a high-growth market. A star does not necessarily produce a positive cash flow for the company. The company must spend substantial funds to keep up with the high market growth, and to fight off competitors’ attacks.” The way our example is set up, there can only be one star. MCFC would have to produce at least the same amount of revenue as the number 1 club. In addition, the market growth rate would have to be at least 10%, according to BCG – we adopt the 10% mark for simplicity reasons and because it seems to be a reasonable figure for this example. 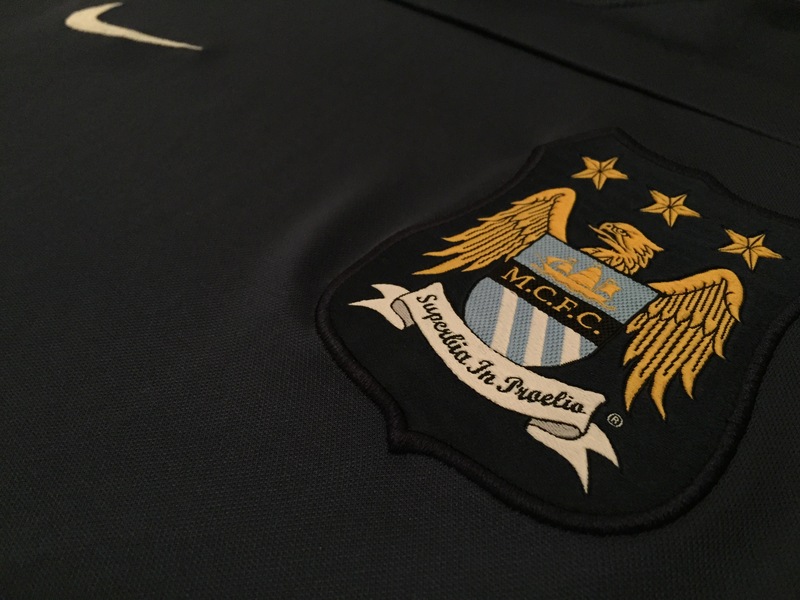 In case the market would slow and MCFC would lose its market leader position, the brand would become what is known as a poor dog. If this were to happen, “the company should consider whether it is holding on to the business for good reasons (such as an expected turnaround in the market growth rate or a new chance at market leadership. (Kotler, 2002:95)” The traditional BCG approach would suggest to get rid of poor dogs. In my personal opinion, in this context, a poor dog brand should be kept and, with a long-term strategy, moved to the left of the chart, closer to the cash cow quadrant. It can be stated that the European football market, as depicted by the Deloitte Football Money League, seems to keep growing healthy for the next few years given the popularity of the Premier League, German Bundesliga, and the UEFA Champions League. If Manchester City FC stays on track with their global business model, which sees their owners – City Football Group – fully or partially owning different football clubs in key developing football regions, the MCFC brand might keep its status as a questions mark, but move closer towards becoming a star.